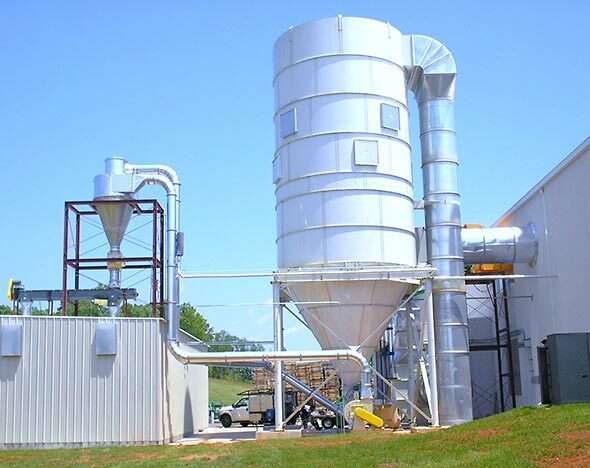 An economical way to handle small or new dust collection needs under 5000 CFM in wood dust applications is to utilize the enclosureless bag filter. Dust is collected by centrifugal force, drop out hopper chamber and also filter section. This unique design is allowed in most woodworking applications by an exception in the NFPA codes. Typically there is no provided means to clean the filter bags which over time must be replaced. Shaker Filters are often used in low air to cloth dust collection applications. This design typically incorporates a low air velocity hopper with either a mechanical shaker assembly that shakes the bags cleaner or some type of tubulator fans to shake the filter media. When this style of filter is properly applied very good results are possible. Pulse jet or compressed air cleaning of filter media was introduced in the early 1970’s. This type of unit was very successful in continuous duty type applications. It allowed for a higher air to cloth bag house which were capable of maintaining low pressure drops across the filter media. Literally more dust collection in a smaller space. Reverse air filters developed in the middle 1970’s achieved many of the same results as the pulse jet filters. Many engineers preferred this style of bag house for its lower maintenance, reliability, and proven low pressure drops especially when used with fibrous dust applications.